if you are interested in becoming a Student Diversity Liaison! Find out about types of training that are available, and possibly will be available in the future. The Inclusive Excellence Team (IET) is a collaborative group consisting of students, faculty, and staff volunteers from across campus striving towards a more welcoming and respectful environment for the University of Lynchburg. The IET helps to oversee the Inclusive Excellence Plan, an additional document utilized in conjunction with Objective 1.4 of Vision 2020+. 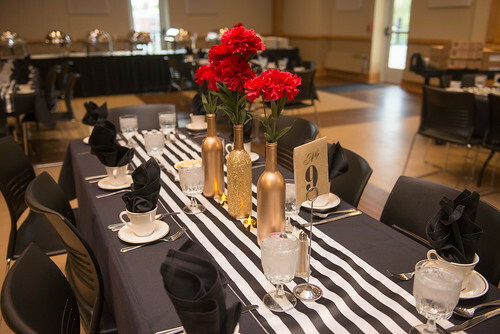 The Student Diversity Council (SDC) representatives are both graduate and undergraduate students who represent various aspects of the diversity found on the campus of the University of Lynchburg. The We are INclusive Team (WIN Team) representatives are faculty members who have a heart for topics of inclusion including the recruitment and retention of underrepresented faculty, ensuring an inclusive curriculum, and mentoring and advising. The Staff for an Inclusive Community (SIC) representatives are staff members who work to promote diverse training and development opportunities for staff, hiring and HR practices, and marketing and advocacy. Donating to the Office of Equity and Inclusion provides opportunities to increase meaningful programming and community education, further contributing to the preparation of students for successful engagement in a global society. Consider giving today! View 2018 Gala images on Flickr. To nominate a deserving community member for their efforts in fostering a more inclusive environment, complete this nomination form.